The French Frigate Shoals ( Hawaiian: Kānemilohaʻi) is the largest atoll in the Northwestern Hawaiian Islands. Its name commemorates French explorer Jean-François de La Pérouse, who nearly lost two frigates when attempting to navigate the shoals. It consists of a 20-mile (32 km) long crescent-shaped reef, twelve sandbars, and the 120-foot (37 m) high La Perouse Pinnacle, the only remnant of its volcanic origins. The total land area of the islets is 61.508 acres (24.891 ha). Total coral reef area of the shoals is over 232,000 acres (94,000 ha). Tern Island, with an area of 26.014 acres (10.527 ha), has a landing strip and permanent habitations for a small number of people. It is maintained as a field station in the Hawaiian Islands National Wildlife Refuge by the United States Fish and Wildlife Service. The French Frigate Shoals are about 487 nautical miles (902 km; 560 mi) northwest of Honolulu. 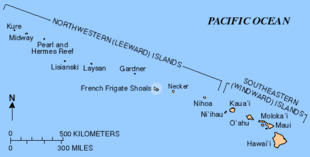 French Frigate Shoals was included among the islands acquired by the United States on 7 July 1898, when Hawaii became a United States territory. In 1909 it was made a part of the Hawaiian Islands Bird Reservation. 1) Whale-Skate Island, currently a double island, is also listed in the census documents together as a block, with an area of 32,020 m². The shares of the islands are estimated (40 and 60 percent). 2) 1971 it was reported that Near Island, although recorded on maps, would be submerged at high tide. 5) Round and Mullet Islands in census documents found together as a block 1006, together with an area of 5540 m2. The shares are valued according to a report from 1971 (0.4 and 0.5 acres). ^ a b c Marts, Chris. "Tern Island: History". college.wfu.edu. Retrieved 2018-08-10. ^ 1962-, Parshall, Jonathan B., (2005). Shattered sword : the untold story of the Battle of Midway. Tully, Anthony P., 1961-. Washington, D.C.: Potomac Books. ISBN 1574889230. OCLC 60373935. ^ "Abandoned & Little-Known Airfields: Western Pacific Islands". www.airfields-freeman.com. Retrieved 2018-08-10. ^ "LORAN STATION FRENCH FRIGATE SHO". www.loran-history.info. Retrieved 2018-08-10. ^ a b Scott, Susan (June 3, 2004). "Tern Island: Noah's ark of the Hawaiian Islands. Part 1: Beauty more than guano deep". archives.starbulletin.com. Retrieved 2018-08-10. ^ "U.S. Coast Guard aircrew rescues 10 from French Frigate Shoals". CoastGuardNews.com. 22 October 2009. Retrieved 29 March 2017. ^ a b Atkin, Emily (October 24, 2018). "Climate change keeps wiping out Pacific islands". The New Republic. Retrieved December 25, 2018. ^ a b Jacobs, Julia (25 October 2018). "East Island, Remote Hawaiian Sliver of Sand, Is Largely Wiped Out by a Hurricane". Retrieved 24 December 2018 – via NY Times. ^ Rauzon, Mark (2001). Isles of Refuge: Wildlife and History of the Northwestern Hawaiian Islands. University of Hawaii Press. p. 55. ISBN 0-8248-2330-3. ^ "NWHI: About: French Frigate Shoals". Northwestern Hawaiian Islands Multi-Agency Education Project. Retrieved October 9, 2016. ^ Philander, Dr. George (2008). Encyclopedia of Global Warming and Climate Change. Thousand Oaks: SAGE Publications. ISBN 9781452265889. OCLC 815786021. ^ a b "French Frigate Shoals (Kānemiloha'i)". www.papahanaumokuakea.gov. Retrieved 2018-08-10. ^ HATFIELD, JEFF S.; REYNOLDS, MICHELLE H.; SEAVY, NATHANIEL E.; KRAUSE, CRYSTAL M. (2012-05-24). "Population Dynamics of Hawaiian Seabird Colonies Vulnerable to Sea-Level Rise". Conservation Biology. 26 (4): 667–678. doi: 10.1111/j.1523-1739.2012.01853.x. ISSN 0888-8892. ^ "TECHNICAL SUPPORT DOCUMENT TO THE PRELIMINARY ASSESSMENT OF THE FWS – HAWAIIAN ISLANDS NATIONAL WILDLIFE REFUGE: TERN ISLAND SITE IN THE FRENCH FRIGATE SHOALS, HAWAIʻI" (PDF). September 2014. ^ "New Species and New Records of Marine Species Discovered in the Northwestern Hawaiian Islands Marine National Monument". ucsdnews.ucsd.edu. Retrieved 2018-08-10. ^ # lat = 23.792563 & lon = -166.2015957 & z = 19 & l = 5 & m = b Bare in Iceland satellite image. Here, the length and width of about 25 meters and 6 are measured, or in an area of approximately 150 m². ^ A. Binion Amerson jr.: The Natural History of French Frigate Shoals, Northwestern Hawaiian Islands. Atoll Research Bulletin No. 150, 1971, Seite 28: Bare Island ... is awash at high tide and is usually about 100 feet long, 10 feet wide, and 4 feet high. It covers an area of 0.1 acre. Wetmore (ms.) in 1923 described it as "60 yards long by 10 wide, merely a ridge of sand rising 5 feet above the water and evidently swept" by waves. Wikimedia Commons has media related to French Frigate Shoals.